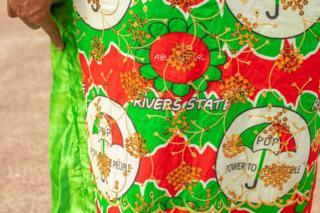 Elections in Nigeria come with style – special cloth is commissioned and tailors are busy as traditional attire takes on a political edge. 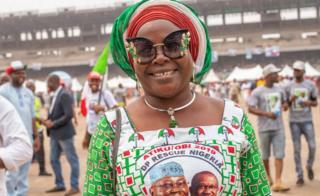 Arike Adesida (above) wears a tailor-made dress for a rally in the commercial hub of Lagos and says she wants President Muhammdu Buhari of the All Progressives Congress (APC) to win a second term. 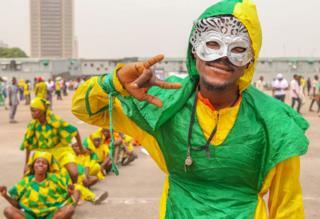 Enthusiastic crowds, dressed in party colours, have also been attending gatherings for Mr Buhari’s main rival Atiku Abubakar, standing for the People’s Democratic Party (PDP). Members of a market women’s association came out to support Mr Buhari and his party’s candidate for Lagos state governor. 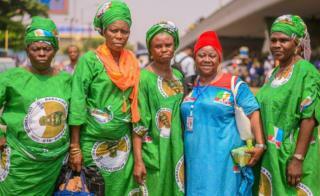 Their leader, Alhaja Chief MA Adebunmi, dressed in blue, says the president is “a dynamic leader” who has “integrity”. 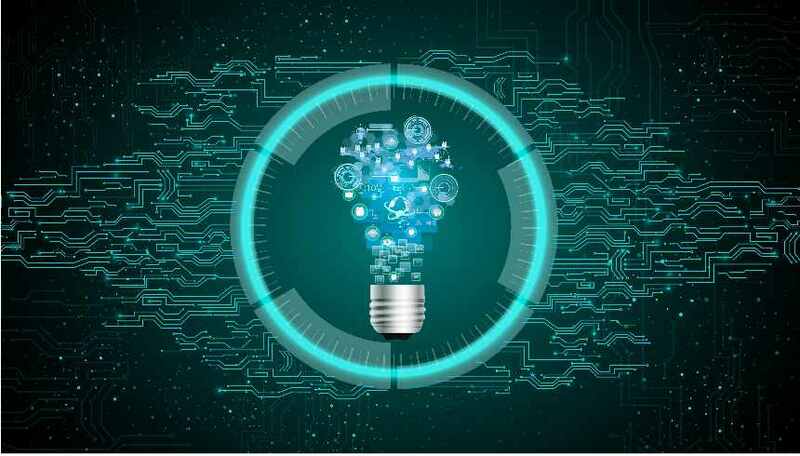 The International Monetary Fund (IMF) has estimated that the informal economy, including markets, accounts for 65% of all money earned in Nigeria. 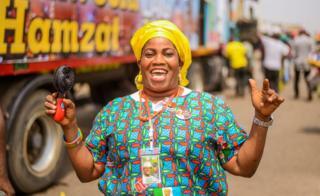 Women from another market association came out to support Mr Abubakar. 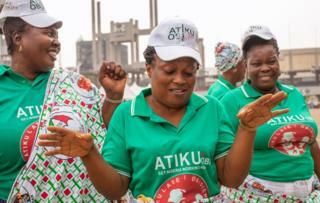 Their leader, Hadiza Mohammed Hajiya Hussein, says they have not benefitted from Mr Buhari’s loan scheme, known as “TraderMoni”. When officials enter the market “they give two or three the loans”, but not everyone is helped, she says. 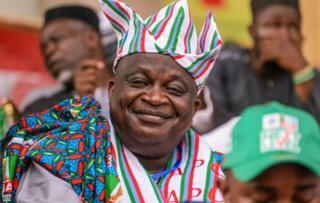 Taiwo Kalejaiye travelled to the Lagos PDP rally from neighbouring Ogun state, wearing traditional Yoruba headgear, known as a “gele”, in party colours. 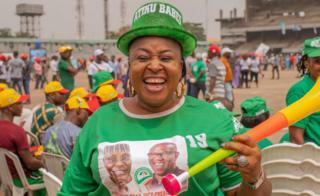 “Buhari’s people don’t love Nigeria, they love themselves,” she says. 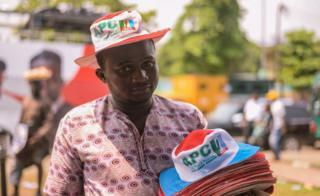 Tajudeen Akanji, a senior member of the APC in the south-west, attends the rally wearing a Yoruba hat called an “abeti aja”. “I believe in the positive things that this president is doing. 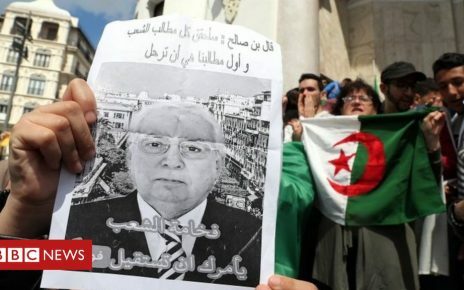 I hope he can continue to get rid of the decadence of the past,” he says. There was also a lot of merchandise for sale at the rallies. 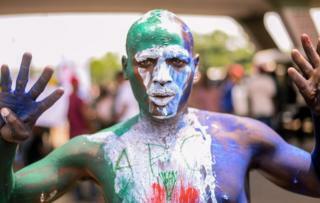 Olumide Olumide goes to the APC gathering hoping to make some money, but he also supports the party. “President Buhari is very good. During the previous regime of Goodluck Jonathan there was corruption, but there hasn’t been corruption this time,” he says. 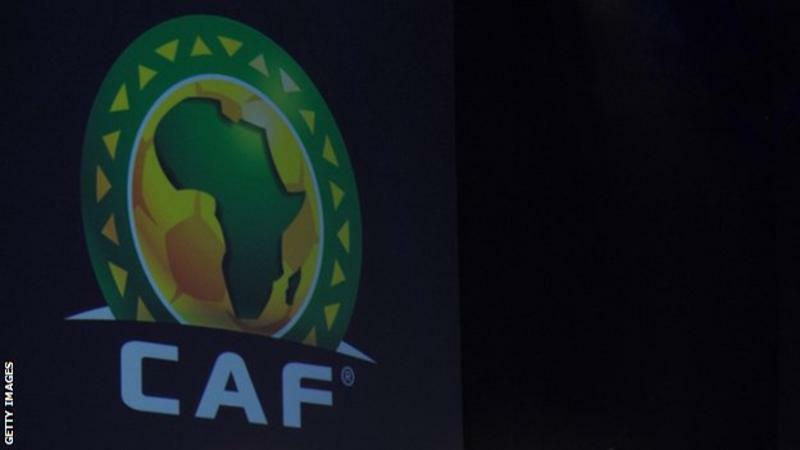 Confederation Of African Football: "No Decision On 2021 Nations Cup Hosts"